Award-winning journalist Thomas Kapsidelis and Virginia Tech massacre survivor Kristina Anderson will explore the experiences of survivors in the decade following the deadliest mass shooting on a college campus at a National Press Club Headliners book event on Thursday, April 4 at 6:30 p.m. in the Club’s conference rooms. 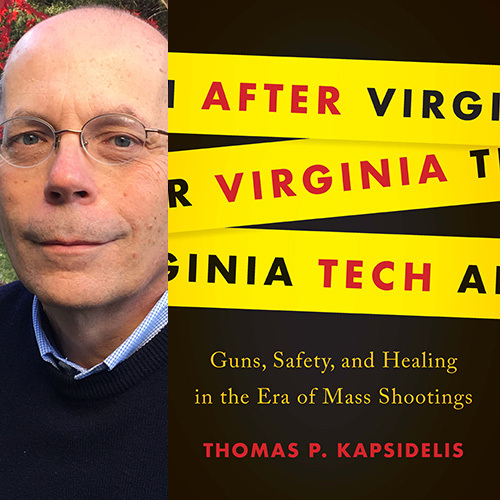 The event marks the debut of After Virginia Tech: Guns, Safety, and Healing in the Era of Mass Shootings, a book by Kapsidelis that chronicles the aftermath of the April 16, 2007 rampage by a lone gunman that killed 32 Virginia Tech students and professors. Then the nation’s deadliest mass shooting by a lone gunman, the tragedy sparked an international debate on gun culture in the United States and safety on college campuses. Experiencing profound grief and trauma, and struggling to heal both physically and emotionally, many of the survivors from Virginia Tech and their supporters put themselves on the front lines to advocate for change. Yet since that April, large-scale gun violence has continued at a horrifying pace. Kapsidelis worked at the Richmond Times-Dispatch for 28 years as both an editor and reporter. He is a fellow with the Virginia Foundation for the Humanities in Charlottesville. Anderson is one of 25 people injured in the attack. The gunman shot her three times as she sat in her French class. She created the Koshka Foundation for Safe Schools, a non-profit dedicated to helping local community and school stakeholders work together to prevent, respond and heal in the aftermath of school violence.